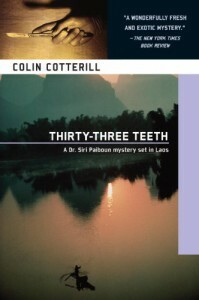 Thirty-Three Teeth is the second installment in the Siri Paiboun series. Dr. Paiboun and his coterie remain as engaging as ever, and while there's a savage, serial murderer loose in Vientiane, the bulk of the novel is more concerned with Siri's efforts to cope with the fact that he's the reincarnated soul of a thousand-year-old shaman, Yeh Ming. Even though the spirits of the dead continue to help Dr. Paiboun solve his cases, those who wish can still rationalize it away as Siri's subconscious working below the surface (God knows, Siri does it half the time). Even so, they are not a gimmick that allows the author to wrap up the mystery. They're obscure and not talkative and Paiboun has to gather the physical evidence to track down his criminals. The only thing I wasn't happy with was the murder of Siri's dog Saloop in a (to me) gratuitous subplot about a thuggish neighbor. I hope Cotterill incorporates it in a later novel so that it takes on a bit more meaning -- we'll see.